DIAMOND Stone & Tile Care is dedicated to making our customers in the Savannah / Hilton Head area happy. We listen to your stone and tile needs and we work hard to not only meet, but exceed your expectations. We work with both residential and commercial clients and offer complete restoration as well as long-term maintenance programs. Working with different natural stones is a skill that requires craftsmanship and a certain process while using the proper equipment and supplies. We have been trained by the best instructors at the best stone and tile school in the country to produce results that are professional and consistent. We specialize in restoring and maintaining your marble, travertine, slate, limestone and terrazzo flooring to remove stains, scratches and etch marks and transform your floor to its original honed or highly polished finish. We can perform the same work on your countertops and vanity tops whether they are marble, granite, travertine or limestone. If all you need is to seal and polish your countertops, we would be happy to do the work for you. We can restore your natural stone shower walls and bath surrounds and resolve such problems as etching, heavy soap film / mineral deposit build-up, and etching. We can repair many types of problems. 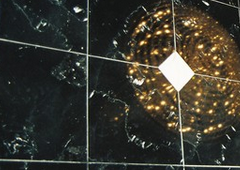 We can fill then polish out seams, repair cracks, chips, refill holes in travertine, and more. We can also remove almost any kind of stain. Tile and Grout Cleaning, Too! When your tile and grout becomes dirty and unsightly, call on DIAMOND Stone & Tile Care to quickly clean them to a sparkly shine.